The owners of a cabaret and drag queen revue must play it straight when their son brings his fiance and her ultra-conservative politico parents over for dinner. The 1996 critically acclaimed smash hit American remake of a 1978 critically acclaimed smash hit French film is a dated but cheerful and warmhearted comedic riff on heteronormative artifice. As well done as the performances, direction, and script are, however, is this movie too much of a throwback to enjoy anymore? The infamous "Toast Scene": Armand teaches Albert to put mustard on toast, walk like John Wayne, and make smalltalk about sports. That a woman wrote the script probably accounts for the notion of masculinity as a disorder — the most villainous characters, after all, are not the clueless conservative political couple who espouse morals superiority while secretly questioning their own relevance. It’s Armand and Val who are the real terrors of this tale, who betray themselves and each other with their own fear and repression in the face of adversity within their own home, but also force someone they both love — Albert — to hide who he is and fit into a pretty limiting standard of normalcy. 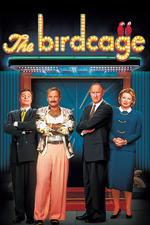 New York Times: "The Birdcage" might seem an odd occasion to find Mr. Williams playing things straight, but this is one of his most cohesive and least antic performances. It's also a mischievously funny one: he does a fine job of integrating gag lines with semi-serious acting, all the while modeling a delirious, silky wardrobe with the emphasis on nightmare prints. Mr. Lane, in the campier role, gives a solid but broad performance without the coy gentility that made Michel Serrault funnier in French. But he has nice legs and looks good in pearls. Variety: The filmmakers have strayed from the structure and characters of the original nary at all, but have adapted it all to a contempo American context with dizzying skill. The ultra-trendy and colorful South Beach setting, with toned, tanned and virtually naked bodies constantly parading along the beach front, couldn’t be more appropriate, and production designer Bo Welch, costume designer Ann Roth and lenser Emmanuel Lubezki, among many others, have combined to create a seamlessly concocted world in which it is hard to determine where reality ends and artifice begins. Buzzfeed: 19 Things You Didn't Know About the Move "The Birdcage"
Man, Hank Azaria's body is insane in this movie. I guess he knew he'd be mostly wearing shorts and nothing else for the movie but he looks like he's made out of helium balloons. Love this movie!! Great post!! Reading material for tonight. Thanks! I love the long opening shot of this movie - just wonderful with the ocean and Miami glowing at the horizon. I had to look closely to see where the helicopter shot dissolves into the steadicam shot for walking into the club, through the audience, onstage, and finally backstage to the stage manager. It's a wonderful establishing shot giving us the glamor of South Beach, the fabulousness of drag, and the fact that our featured performer is a giant flake. Not casting Robin Williams as the more openly flamboyant partner was brilliant. We *know* how wacky and over the top he can be, so seeing him being the more subdued partner makes for an even better performance. The exteriors of this film are wonderful. I miss the days when exteriors had to be done all at one time, with the lighting being just right. This film is one of those films where the location itself is a character, like San Francisco in Vertigo and Sneakers. There is nothing that is not perfect about this movie. Not least the utter honesty--between each other and to real life--of the relationship between Armand and Albert. They're so totally in love and married and a team, it's the rock of the movie. You wouldn't buy if if they didn't have the history and easy familiarity. One other thing you may not know about this film (surprised that Buzzfeed missed it) is that Dan Futterman plays Val (it's a tricky role, because he has to want this awful thing and yet retain audience sympathies, and I don't think he quite pulls it off, alas); Futterman is perhaps more successful as a screenwriter today, and has collaborated with Bennett Miller on Capote and Foxcatcher. Both screenplays were Oscar nominees. Flockhart and Wiest both have somewhat thankless, passive roles, especially considering May's having written the screenplay. But it's a guys' movie, and it doesn't fully pass the Bechdel Test. Flockhart has the worse hand, though, because she has to appear both wholly repressed by this family environment, yet winsome and engaging enough for Val to want her so badly that he'd ask for this deception. Baranski has a carefree, fun, breeze in for the dramatic bits role that works a lot better (and helped free her to work off the boards, at last). It's funny that Azaria in his thong is just about the dirtiest thing in the movie (save maybe some of the art). He's obviously thrilled to camp it up to 11, and I'm not sure when there's been a role that really called for that more since, oh, the original The Producers. Meanwhile, Williams seems determined to go the other direction (other than the dance bit), emphasizing the normality of a nominally gay man, something that's been in discussion with current television offerings vs. characters like Titus in Kimmy Schmidt. Politically, and career-wise, the better choice, though it also frees up space for Nathan Lane. But in the end I'm troubled on a rewatch with how much it seems to mine the gay panic and emasculation themes for what is essentially chuckles. (I'm also a bit disturbed by how the ambiguity of the opening scenes makes us wonder if Val is a boy toy rather than a son; it seems unnecessarily creepy in retrospect.) When you get down to it, the acceptance message of the film seems quite weak, in comparison to the be-yourself and in-your-face message of Rocky Horror PIcture Show which was twenty years earlier. Of course, the French La Cage had its own origin in the 1970s, and while much works about the Miami Beach setting, I'm not sure that the 1990s really is the right time to set that story, at least not with some of the portrayals within. Not saying that runs it into the ditch, just diminishes it a bit for me. Since I'd seen it in the theater I'd, well, not to overcomplicate it, grown. I just didn't feel the film had grown with me, as many really good films will. It has just enough in the way of broken wheels to make that awful shopping cart clatter as I watch it. So many lines from this movie remain in day-to-day usage between my wife and I. If I had to pay Nathan Lane $0.05 every time I said "I've pierced the toast" I'd be broke. So many great lines with great timing in this. "How Egyptian" gets a lot of mileage at our place.